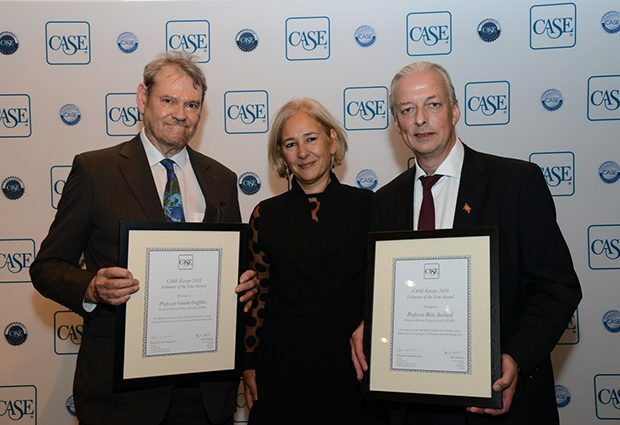 The organisers of the EMBL in Norway event at the University of Oslo, Gareth Griffiths and Rein Aasland, were presented with the “Volunteer of the Year” award from the Council for Advancement and Support of Education (CASE) in August 2018. Rein is currently the head of the Department of Biosciences at the University of Oslo, as well as the vice-president of the Human Frontier Science Program. Gareth is a group leader in Rein’s department and has been the chair of the EMBL Alumni Association board since 2016. The EMBL in Norway event, held in September 2017, showcased the role of EMBL, EMBO and the Human Frontier Science Program (HFSP) in supporting life sciences worldwide, with particular focus on Norway. Rein and Gareth dedicated a year to mobilising the life science community in Norway to contribute to this event. Speakers included EMBL alumni currently doing research in Norway, EMBL researchers, directors of EMBL partner institutes and a representative from the Norwegian Research Ministry. EMBL students were also included among the speakers, to encourage and motivate other young scientists. Rein and Gareth raised €15,000 from their institutes and the Norwegian Research Ministry for the event, thereby successfully engaging individuals, institutions and government in their goal to advance EMBL. This award draws attention to the impact that alumni can make with their time, know-how and networks.